What happens in the unseen world? It is a question artists have tried answering through their media since the beginning of time. Perhaps it is one of the reasons Georgia O’Keeffe’s paintings have always pulled at me. While we try to remember to “stop and smell the roses,” she is examining their inner caverns, the hidden places that other than her seeing eye, only pollinators explore. Her close cropping to focus our attention on the interior world of a flower can’t help but keep me transfixed. My own appreciation came at a young age, probably at an art exhibit in Dallas. Overwhelmed by her vibrant use of color and lines, I sought out her work in the beginning entranced by the floral compositions. The red poppy might still be one of the most iconic works by her but recently, I found myself equally moved by Red Canna, 1919 with colors that anywhere else might clash, but here, orange, coral, burgundy, chartreuse, turquoise and purple cavort playfully. Recently, I attended the Lake George exhibition of O’Keeffe paintings at the DeYoung museum in San Francisco. The idea had been to wake up early enough to have time to spend lingering in front of the paintings before the melée of the masses had roused from their beds. What is it about O’Keeffe’s paint style that beckons to throngs of people? 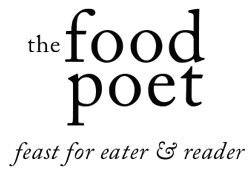 This quote makes me think of David Chang’s offhand remark to Anthony Bourdain about Bay Area cuisine consisting of figs on a plate, but how ingredients like figs on a plate get interpreted and assembled into a larger whole. Her assertion that in the abstract she finds the definite makes me wonder how each of us clarify the intangible? For her, she paints to get closer to the truth. For me, I write and sometimes sketch really bad poems to get closer to the Poem. Isn’t that the object of the artist- to figure out where to turn the attention of a by-stander, to understand that the work will become public domain as soon as it is seen but first to figure out what the work wants to say and then slice away all superfluous and extraneous detail so that there is no confusion as to where to look? It’s not as if she is averse to detail. No, one thing that makes her paintings shimmer are the illuminated edges where flowers touch leaves or one petal ends and the other begins. It hearkens a halo effect on the inside of the flower forms that creates dimensionality. As in poetry where one thing might stand for another, this kind of indirect communication is something that makes paintings the very best kind of puzzles. At the end of the exhibit one wall bears three paintings of leaves. Without reading the description to the right of the central painting, there is one looming leaf and another that is diminished and brittle. The loneliness in these paintings made me hate them. Their lack of that infusion of color and choice of muted tones made them cold and uncaring. It didn’t take much to see that these works were important for the artist even if they were not emblematic of the whole body of her work. They seemed to me like catharsis paintings and I felt sorrow for the small leaf on the outskirts. But even in these dull colors of decay and fall, a lesson emerged of beauty displayed in the sheen of satiny leaves. 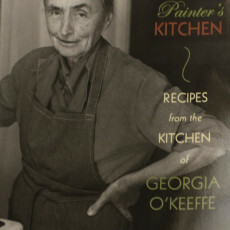 Georgia O’Keeffe’s paintings take a risk. They embody an urgency to live life now – to open one’s eyes to the incredible unseen world all around us. 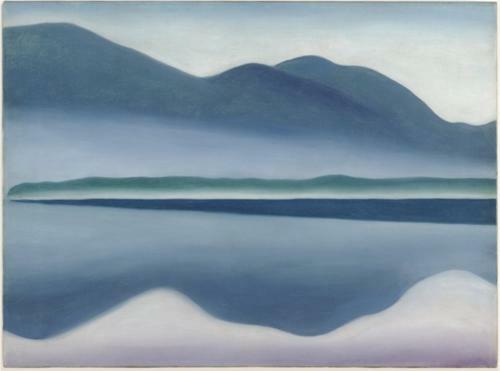 I left the Georgia O’Keeffe Lake George exhibit charged with energy to keep my creative work progressing. I also heeded the not so subtle nudge to get outside and slow down enough to appreciate what is always changing, always growing or dying but never ceasing to impart some great truth about why we are all here. So, if you write, write on! If you paint, paint on! If you sing or play guitar, play on! The time is now. Like the colors outside that keep changing, so will life. I’m grateful to keep her vibrant outlook writ on the walls of my mind for the journey ahead.